One of my favourite Christmas presents was a beautiful set of Ted Baker makeup brushes, which was from Boots as part of their Christmas Gift range. 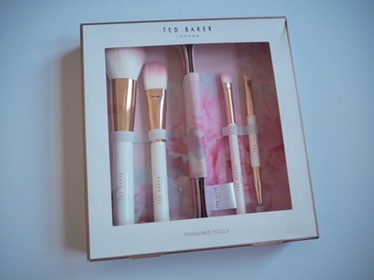 The set includes a foundation, blusher, eyeshadow and eyebrow brush, and they came in a gorgeous Ted Baker designed case, which I love almost as much as the brushes themselves and is totally convenient for transporting the brushes whenever I go away. It also protects them in general on a day to day basis in my bag if I want to take them out and about. Before I got the brushes I used a foundation brush and blusher brush, and the eyebrow brush included in my urban decay naked palette, but it was nice to stock up on a complete set. The brushes are lovely and soft and seem to be of good quality and appear long lasting, although of course only time will really tell. I’ve not gone to clean them yet, so I’m not sure how well they’ll cope with that, but generally they are doing well and I love the compliments I’ve had when people have seen me touching up my makeup in public with them. 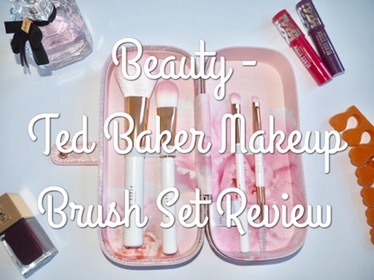 I would definitely recommend Ted Baker brushes if you are, like me, a totally girly girl who loves anything pretty and pink (plus they make awesome flat lay props and are totally Instagrammable)!